There’s all kinds of teamwork happening here–regular citizens stepping up to help public transit! Jeep owners and 4Runner owners driving together?! Maybe Canada really is as friendly as everybody says. 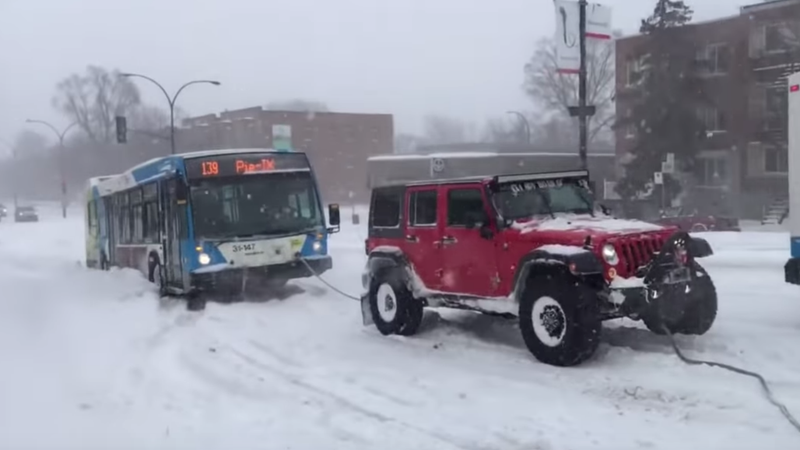 Earlier this week Driving.ca via CTA News Montréal reported that a band of three good samaritans in 4x4s were spotted daisy-chained together pulling a Montréal city bus out of a little ice patch in front of a bus station. You might want to turn that video off before the camera operator starts running, but the first bit is fun to watch. I can’t tell exactly where in the city this is, but the bus’s route “139 Pie-IX” is lit up above the windshield so it’s safe to say this was somewhere between the Carrefour Henri-Bourassa and Notre Dame stops. If you’re in the area, make sure you stop at Les Katacombes. It’s our very favorite goth nightclub. And if you’re getting dinner at Au Pied, make sure you don’t go too crazy on the foie, eh? As for the legitimacy of this method of towing, I mean, it worked didn’t it? I’d be a little wary of this much mass wiggling around on a slippery surface, but this group is certainly not the first to team a bunch of trucks together to pull something. And when is the last time you saw a modified Toyota Sequoia? That’s pretty neat.